The Simon's Reagent kit is a secondary test (after Marquis, Mecke, Mandelin) that tells the difference between MDMA and MDA, between methamphetamine and amphetamine, or between MDPV and methylone. Contains two bottles with enough reagent for approximately 50 tests. Please read the information in the full description below before purchasing and using. The Simon's Reagent kit is a secondary test (after Marquis, Mecke, Mandelin) that tells the difference between MDMA and MDA, between methamphetamine and amphetamine, or between MDPV and methylone. The kit contains two bottles (Simona A and Simons B) with enough reagent for approximately 50 tests. Simon’s reagent is sodium nitroprusside in a basic buffer. It works by detecting ‘secondary amines’, such as the ‘meth’ in METHamphetamine and in mythylenediaoxy-METHamphetamine (MDMA). We use it after testing a substance with Mandelin, Marquis or Mecke Reagent. If a substance tests positive for an ecstasy-like substance by turning to purple/black with Marquis or Mecke, or to blue/black with Mandelin, then a color-change reaction with Simon’s indicates the presence of MDMA or MDE. If a substance tests positive for a speed-like substance by turning orange with the Marquis reagent, then a color-change reaction with the Simon’s indicates the presence of methamphetamine. If a substance tests positive for a cathinone substance by turning yellow with Marquis or reddish-brown with Mecke, then a color-change reaction with Simon’s indicates the presence of methylone or butylone. Instructions are also included inside the packaging for the reagent. The Simon’s reagent actually consists of two reagents in two, separate bottles, marked “A” and “B”. Bottle “A” has a yellow label, and bottle “B” has a green label. This test is to be used only after you have first received a positive result with Mandelin, Mecke or Marquis reagent. It should never be used alone. Always use one of the other reagents first to identify the presence of a particular set of substances Only afterwards should you use this test. Never have more than one reagent bottle open at a time. If you mix up the caps and put the wrong cap on the wrong reagent bottle, this may cross-contaminate the reagents and ruin them. Be sure to perform the tests in a well-lit location. Take reagent bottle “B” (the lime-green label) out of its plastic safety container, remove the cap and add a drop of the solution into the same powder/liquid already on the plate from step 2. Replace the cap and put the bottle back into its safety container. Observe the color change right away. Use the Simon’s column of the color chart included with your kit (and below at the bottom of this section) to evaluate your test. Note: In some kits, solution A may be a dull sea-green color, or it may be clear. This is normal. What you’re looking for is a change in color. In all cases, the presence of MDMA/MDE/Methamphetamine/methylone will be indicated by a change to a bright cobalt blue. If no color change is observed when solution B is added, then the substance contains MDA, amphetamine, or MDPV. What are the known limitations of these kits? 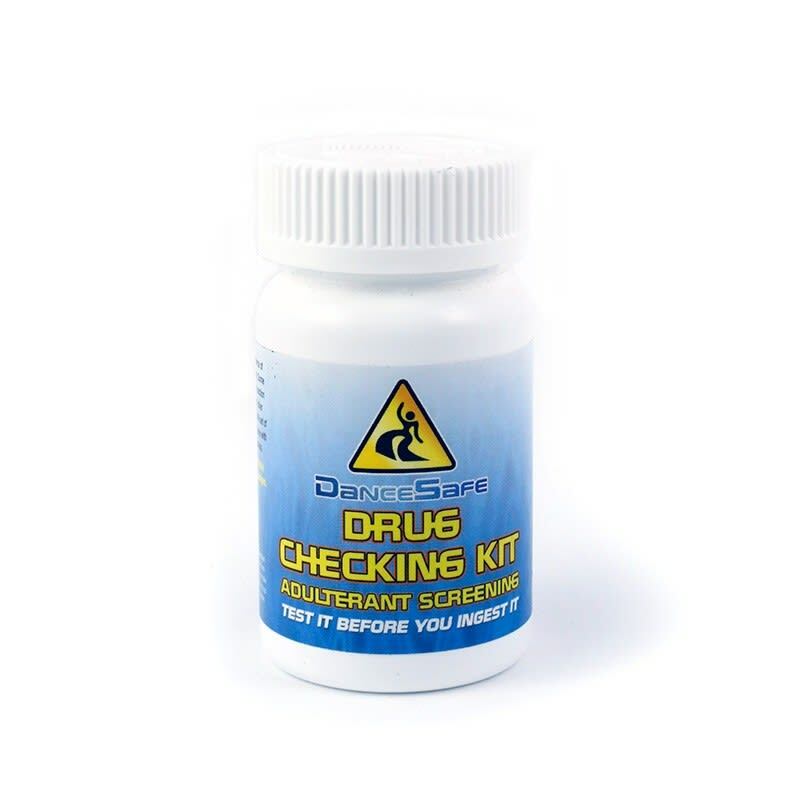 The drug test kits by dancesafe are presumptive tests. This presumptive home drug checking, also known as pill testing or adulterant screening, is just a harm reduction service, and may not provide 100% accurate results. A specific reagent in a kit will only check for presence of a specific substance or set of substances that it can test for, but will not indicate presence of other substances that this reagent is not designed to check. The reagent test can not indicate the quantity and purity level. The instructions and color codes are also subjective, and may cause confusion and inaccuracy in reading the results. All packages are shipped in a non-branded discreet packaging. Each package includes the instruction cards, in addition to the reagent. I have questions before I purchase or I need further help with Testing! Please visit the DanceSafe website for detailed instructions (https://dancesafe.org/), or contact their support for any help (https://dancesafe.org/contact-us/). Dancesafe you guys are the best! !